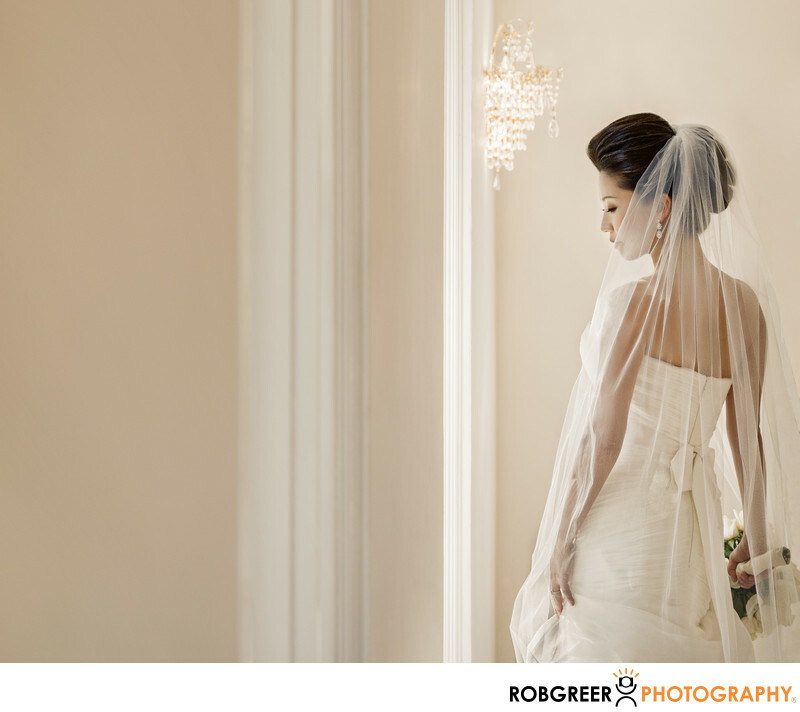 This portrait of a bride at Ambassador Mansions and Gardens in Pasadena is perhaps my favorite wedding photograph from 2012. It's certainly not the most dramatic of wedding photographs but I believe that it epitomizes what most clients want from their wedding photographer. I love how the bride is peacefully standing by the window. When taken singly, it tells a small story—perhaps of her thinking about the life she will spend together with the man she loves. Interestingly, this photograph was entered in the 2014 Wedding and Portrait Photographers International (WPPI) 16x20 Print, Album, and Filmmaking Annual Competition. It was awarded a score of 79 which indicates an "average professional skill and technique." I was naturally disappointed with this score as I felt this photo was one of my strongest competition entries for 2014 and, as I mentioned previously, perhaps my favorite photograph from the 2012 wedding season. Beyond the composition and beauty of the image, if you zoom into this photograph, you'll see the fine details and exceptional handling of the exposure. That being said, I must be circumspect. When judges award you with a great score for an image, they are geniuses. When they fail to award an image, they are idiots. Such is the nature of photography competitions. Ambassador Mansions and Gardens is located in Pasadena, California. Website: http://ambassadorcampus.com/. Contact Person: Sylvia Noland, (310) 292-5393, sylvianoland@aol.com. Keywords: Ambassador Mansions and Gardens (6), Pasadena (33), WPPI (6). 1/80; f/4.5; ISO 500; 86.0 mm.